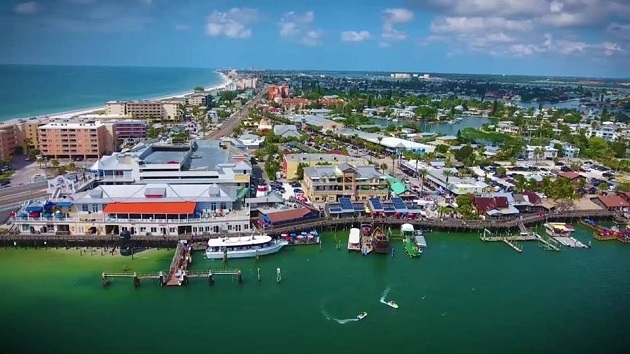 John's Pass Village, the Historic Fishing Village and Boardwalk has been a favorite place to shop, drink, dine and enjoy a good time on the water for decades! Their annual seafood festival is not only a popular local event but it's the second largest seafood festival on the east coast. The 37th Annual John's Pass Seafood Festival will be returning strong this year, October 25 - 28. The four-day festival is non-stop musical performances and hundreds of craft vendors and local businesses bringing a ton of amazing seafood to Madiera Beach! This year John's Pass is trying to reclaim their title as the World's largest Bloody Mary toast, so head out to the main stage Oct. 28 at 1:00 p.m. for your free Bloody Mary and help get them to 3,000. Enjoy free concerts from top bands every day of the festival, find unique gifts at the Arts and Crafts Show and take part in a Halloween Block Party Oct. 26 from 7-11 p.m. and wear your best costume to fight for the title of Halloween God and cash prizes in the costume contest. Bring the kids out on Oct. 27 for the Kid's Costume Party and trick-or-treating. Look for the orange pumpkin in the window and go in to get treats from 1:00 - 6:00 p.m. and be sure to register for the contest before it starts at 3:00 p.m. And every day there will be the largest seafood selection ever in the history of the fest to enjoy. One of Tampa Bay's greatest culinary events, Flavors of the Gulf, will be Thursday, Oct. 25 from 6:00-10:00 p.m. There will be 16 of the areas best restaurants to sample and pair with craft brew samples from 20 local breweries. Local bartenders will be mixing their signature drinks, trying to win your vote. And there will be live music to dance to all night long. Even better, you'll be supporting A Reel Future, a local non-profit and might win the Flavors of the Gulf trip to the Plantation on Crystal River. If you like 5Ks, be sure to get out to the Seafood Fest 5k combined with the John’s Pass Seafood Festival. Enjoy the breath-taking view of Madeira Beach as you take your morning run, and every registered participant will get a $5 discount coupon for the festival starting at 10:00 a.m. This event is partnering with the LUPUS Foundation, Florida Chapter and a portion of the proceeds will go toward their work. The John's Pass Seafood Festival Battle at the Pass fishing tournament will take place during the festival where you can watch the weigh-in or better yet, register to fish yourself. There is a guaranteed $2500 prize for first place. The Captain's Party kicks off the tournament battle Thursday, Oct. 25 at 7:00 p.m. in the main tent, WWeigh-Inis Saturday, Oct. 27 at 4:00 p.m. on the John's Pass Boulevard Stage. It's only $100 per team. There is a Spanish Mackerel division, a Big Fish Calcutta division and a King Calcutta division (listed under Spanish Mackerel). General Admission is free, however, free parking is not guaranteed. Street parking and lot parking are available yet will be hard to come by unless you are early to the party. For mapping, the 6-floor garage is located at 179 Boardwalk Place W Madeira Beach, FL 33708. To get to the garage, enter John’s Pass at the southern-most entrance, then make your first right, then make a right when you dead-end. The parking garage will be immediately on your right. John's Pass Seafood Festival parking at John’s Pass Village is $20. Parking is also available at Madeira Beach Shop, Madeira Beach Access Park, and John's Pass lot with metered spaces. Handicapped parking is located on 130th and Gulf Boulevard and valet parking is available for $25. There is a shuttle service to and from John’s Pass Village during festival hours Oct. 25-28. If you can, we recommend staying at the beach for the weekend and taking the Beach Trolley in and out or grabbing a Taxi, Lyft or Uber each day. When you stay more than a day or two, you can get a weekly parking pass for $20 by calling Madeira Beach City Hall at 727.391.9951. Have you ever wondered how John's Pass got its name? Back in 1848, the beach was a solid barrier island up the coast to Dunedin, a hurricane came through cutting the pass. The sand now is gone, a pirate named John Levique made the first voyage through the new pass in 1848 naming the pass 'John's Pass'. Located on the waterfront this historic Village has managed to maintain it's quaint turn-of-the-century fishing village vibe while at the same time serving as Pinellas County’s #1 tourist attraction. We've always felt it was businesses like Hubbard's Marina, the local fishing fleet, dolphin watching, and shelling tours, boat rentals, parasailing, and jet skiing vendors, shopkeepers, and restauranteurs that keep the ambiance of old. John's Pass is a place to cherish and celebrate and the time to do it is Oct. 25 through the 28 during the famous John's Pass Seafood Festival. Connect with us on 727area to keep up with all of the fun events in Madiera Beach and around Pinellas County. Best of all, it's free!